Q. How much money can I save? An average dental tourist saving around £ 2.500 (around € 3.400) based on making 2 implants, 8 porcelain crowns, 10 fillings (composite restaurations), 1 panoramic x-ray, 4 intraoral x-rays, visiting TriDent Budapest 3 times. Let's take another example in Euros. Say your dentist says you need twelve crowns or units of bridgework at 900 Euros per unit. That's a total of 10 800 Euros. At TriDent Budapest that would cost 2316 euros. If we add 15% to that to cover any extras, that is a total of 2663 Euros. That would represent a huge saving of over 8137 Euros on your local dentist's price giving plenty of scope for an enjoyable stay in Budapest. Q. Why dental treatment so inexpensive in Hungary? Because the overheads for a dentist in Hungary are lower than in many European countries. See TriDent INTRO Package NOW! Q. Are there any extra charges? All of our premium services are free of charge. We do not charge for our extra services - consultation, transfer, etc - therefore the cost of your treatment is easily predictable. Q. Is Hungary in the EU? Hungary joined in the EU in May 2004. There are now no travel or trade restrictions in place between the EU and Hungary. EU regulations apply now as in other member states. The crowns, bridges, implants, whitening and dental prosthesis’s are made of the same materials that are used in Western Europe, USA or Canada, and also with the same equipment (meeting the EU quality standards). Q. Will I need a visa to Hungary? No visa is necessary since Hungary is the member of the European Union. It is strongly advised that you bring your passport with instead of an ID. Q. Do TriDent Budapest use advanced technology? 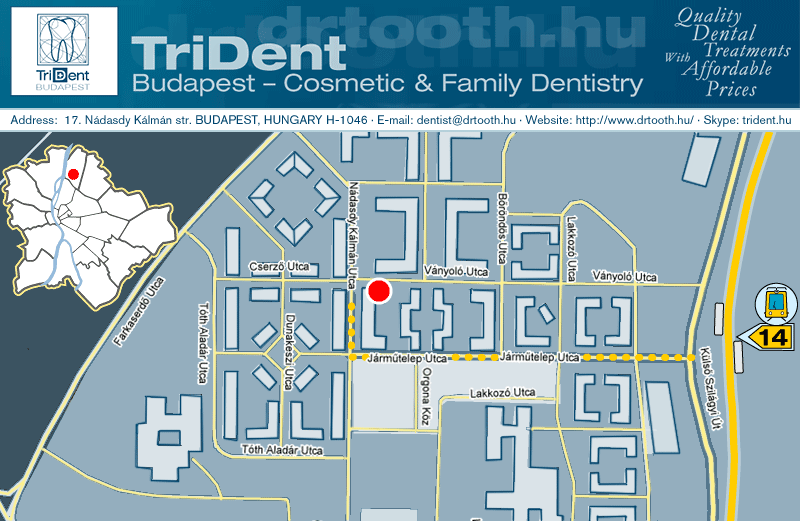 TriDent Budapest have the latest computer controlled dental units by SIEMENS, oral camera, conscious sedation unit with pulseoxymeter, radiowave surgical unit by Ellman USA, x-ray system etc. Learn more about our High Tech Equipments! Q. What are the credentials of the Hungarian doctors? The Hungarian doctors are famous throughout the world for their high qualification, expertise and practical experience so their credentials are up to par with any of those in the western countries. Learn more about our doctors, and see the Testimonials menu! Q. How long do I have to stay in Budapest? One week is normally enough for most crown and bridgework. Implants require a 3 full days stay with a return visit of 10 days after about 6 months. Q. How can I speak to my Hungarian dentist? What about the language barrier? Dr. Toth (at TriDent Budapest) speaks English fluently (VIDEO!) and fluent Italian support is provided. Learn more about Dr. Toth! Q. Who else goes to Hungary for dental treatment? Besides the British, Irish and Americans many thousands of Swiss, Italian, Dutch, Scandinavian people fly to Hungary for dental treatment in addition to 1 million Austrians every year. Q. What currency can I pay for my treatment? You can pay in Euro, GBP, USD or HUF (Hungarian Forints). Cash payment preferred. and when should I give a notice in advance? First please complete our simple online Enquiry Form and we will respond as soon as possible. In the next few days we can book you the convenient appointment according to the planned teratments. Generally we need at least 2-3 weeks to book appointments To book an appointment you can alternatively send email, or give us a call: +36 20 945 8797 (English is spoken) (at least 2-3 weeks before the planned visit to TriDent). Q. Can I take friends/family members too for dental treatments? Yes, you can, please send the details listed in the online Enquiry Form in connection with your friend/family member too. This way you can reach further more discount of your dental bill. See our Prices for Further Discounts! Q. What if something happens back in the home (UK)? In our experience the chance of complications occuring is extremely small. In case of any complication our dentists will give expert advice and find the quickest way to solve it. If needed you will get an appointment straight away. Any problems immediately have top priority and appointments are free. Your flight can cost less, than an appointment in the UK. As a flight takes only 2.5 hours from the UK you won't have to wait long. As a comparison: recently (May, 2005) a consumer group contacted 321 UK practices asking if they could get an appointment within 24 hours. Just under half were able to offer one in one day even if the client was prepared to go privately. Q. How can I travel to Hungary? Travel by plane from the airports of London to Budapest takes approx. 3 hours. You can choose regular airlines like Malév or British Airways. Since 2004 economy (low cost) flight operators are also available from various destinations. Q. How will I get from the airport to my hotel? When you arrive to Budapest our colleague will welcome you and take you to your hotel in the city and also will drive you between your hotel and the dental surgery for free whenever it is needed. Q. Where can I stay in Hungary? TriDent Budapest recommends you hotels according to your requirements. The recommended hotel will be close to TriDent Budapest, so that transfers to and from the clinic are quicker and less complicated. From the hotel we will help you in organizing sightseeing tours if required. Q. Will my cell phone work in Hungary? The mobile frequencies used in Hungary are 1800Mhz and 900Mhz. Moblie providers: T-Mobile, Vodafone, Telenor. After arriving you can ask for a prepaid (with appr. 10 GBP) Hungarian mobile phone for free calling TriDent Budapest while you are staying! Q. Will I have online access to check my e-mails? Yes, you have several opportunities for your online access, for example: your hotel, internet café etc. For our patients we provide free internet access at the internet terminal in the waiting room of TriDent Cosmetic & Family Dentistry. Q. Will I be able to use my electronic devices? In Hungary the voltage is 230V. The plug is the same as used in Austria and Germany. Q. Will I have time to do some sightseeing during my stay? Yes, you will. In some cases you will have an entire day available on other days a morning or an afternoon. We will present you with offers upon your arrival, and you can choose from a variety of activities. Q. Will someone guide me on my travel? Yes, upon your request. Besides there will be organized group activities – sightseeing tours – which you may join. Q. What can I do in my freetime? Budapest, one of the nicest capital of the world offers plenty of activities, and rich in cultural attractions. Budapest is often described as the 'Paris of the Danube' and sometimes the 'Pearl of the Danube'. Budapest has castles and a palace with an art gallery inside, museums, the biggest parliament in Europe right on the bank of river Danube. Budapest has some of the best thermal spas in Europe. Find more questions and answers on dental implants here. Learn more about our cosmetic treatments and smile makeovers (with case studies) here. Learn more about our high tech equipments here. Learn more about our dentists here. Visit „Testimonials” menu for costumer opinions about TriDent Budapest. We will answer any questions you may have and will aim to get back to you with as much information as we can usually within 24-48 hours.